Go home with a Memory not a Souvenir! EAT, SMELL, & FEEL your way through Amlapura town, on your sensory journey of culinary delights. The chef at Bali Asli will guide you around their favourite eating spots in Amlapura. You will get to savour some of the regions best kept culinary secrets. Visit East Bali’s No.1 suckling pig Warung and enjoy this delicacy whilst over looking the stunning views of Mount Agung after returning to Bali Asli with your morning’s bounty. Start your evening adventure at Bali Asli before heading out for dinner. Enjoy a home-made cider and local snacks on our balcony as the sun sets behind Mount Agung. Then adventure down to visit the street vendors in the lively culinary scene of Amlapura, that is both diverse and confrontingly fascinating. Our adventure is carefully planned to give you an authentic taste of Eastern Balinese local street fare in a safe environment. Relax and enjoy the ride as you sit on the back of your vintage Vespa motor scooter! We will start the tour at the King’s Palace of Amlapura with your exclusive tour behind the scenes. 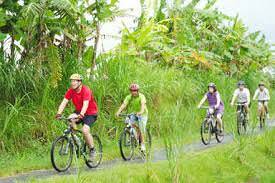 Then we will ride through the streets of Karangasem to visit a black smith making the traditional blades used for ceremonial knives. In a village called Budakling a holy man will show you how he makes the gold gilded decorations for the high priests head dress while you sit and enjoy a Balinese morning tea. Your next stop is Tirtagangga, the Royal swimming gardens, wander around the pools of crystal clear water before entering the temple for a blessing by the local Mangku priest. After a leisurely cruise down to the coast to Taman Ujung water palace, where a Balinese picnic lunch will be served in the pavilion on the water. Lempuyang temple, meaning the highest lantern, is one of the highest and sacred temples in Bali. It sits atop Belibis mountain 1,058 metres above sea level. It is a 2.5 hours hike to the temple at the top. This spiritual journey will wind through misty ancient pandan forests, vanilla vines, native orchids, along a combination of grassy paths lined with lemon grass and steep rocky tracks. 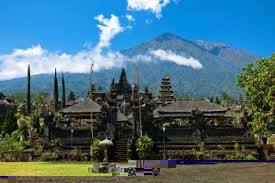 Once you reach the summit you are rewarded with breath taking views over looking the east of Bali from Karangasem valley to the ocean and across to mighty Mount Agung, Bali’s famous volcano. After a traditional ginger and ginseng morning coffee and some jajan cakes, you will accompany your guide into the temple where the priest will bless you with holy water collected from the insides of the bamboo growing near the temple. Your descent will be via the 1700 steps and passing many other sacred temples and places of spiritual importance. 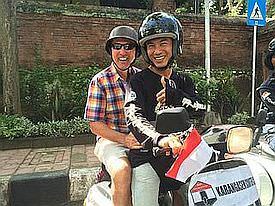 When you reach the bottom you will be picked up and driven 15 minutes to Bali Asli for a well-earned megibung lunch, served in the style of the Royal family of Karangasem. Our Biking guide, Pak Mudi will drive you up into the small villages in the foot hills of Mount Agung where you will mount your mountain bikes and glide (mostly down hill) through rice fields, snake fruit forests, small towns all the way to Tirtagangga royal swimming gardens, where you can cool off in the crystal clear swimming pool fed by water flowing directly from the holy spring, then enjoy a “Bungkus” or picnic lunch in the gardens of Tirtagangga, cooked by our Chefs at Bali Asli. Bali Asli’s cooking classes and adventures are available most days or on request. Our classes run with a minimum of 2 and up to a maximum of 10 students. Nothing at Bali Asli is set in stone and we are happy to tailor our programs to suit your itinerary or corporate / special event. 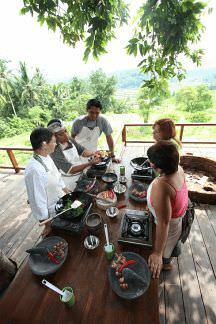 The cooking school runs unique classes themed on “a day in the life of…….”; every class includes a Bali best adventure into local areas off the beaten track. Whether it is learning how to plant rice or plough with a cow, fishing in a jukung canoe and cooking on an open fire or making cocktails from cashew nut wine, our students always leave with fond memories and new skills to experiment with when they return home. For those who would rather have our chefs cook for them, the adventures can also be enjoyed before returning to Bali Asli for a feast. To make an enquiry or a reservation click here. Most of our ingredients are either grown in our garden, in our neighbour’s garden or purchased from the local market. Our menu changes almost every day, depending on what our chefs find at the market early in the morning or from our garden or what our neighbours bring to us on the day. 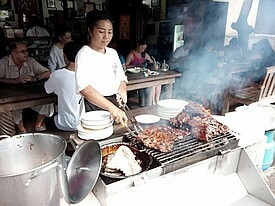 The menu offers traditional Balinese food prepared in an authentic style kitchen. We cook on wood-fired mud brick stoves, allowing the real flavours of Bali to shine.